The Phoenix 17 was a huge success for Ireland across the board. You will no doubt have read Dean Parkers update on the Target Shotgun guys – who on their first International outing did us all very proud. I would like to give you a bit of a tally on how we did in the Gallery Rifle Sports – and it was one of our best. There was a very large number of Irish Competitors – 30 or so – although at times it looked like far more. The weather was amazing – temperatures in the high 20s with plenty of pasty white legs getting their first outing in a pair of shorts. NASRPC had entered teams in both the GRCF1500 and GRSB1500 IGRF International matches. We were quietly confident going in – but the British and German teams are very strong so we needed to bring our A game. And we did. 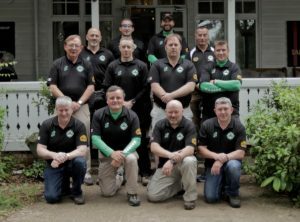 When all the tallying was finally done …..
Ireland had secured the Gold in the Smallbore International match with a team score of 5902.327 – beating Great Britain on 5849.329 and Germany on 5752.243. In the Centrefire match we only managed Silver – but with some very good shooting. Mike Nestor with a score of 1496.119 put in the best performance, however, the British team were simply more consistent throughout and pipped us by a margin of only 19 points out of the possible 6000. The final tally was Great Britain 5944 410, Ireland 5925 396 and Germany 5887 341. These are always very tightly contested matches – and with teams coming in from South Africa and Australia aswell for the World Cup in MNSCI in in July – it’s gonna be even tougher ……. But we’re gonna do it. I have spot picked out on the mantlepiece for the World Cup. Right between the picture of JFK and the child of Prague. Individual performances were no less impressive. IPAPCs Jeff Kehoe was on fire – indeed has been all year. He broke his own GRCF 25m Precision record – which he only set in MTSC a few months ago with a huge score of 299.019. He set a new Irish record for GRCF1020 – with a score of 1020.088 – beating the previous record of 1020.087, set by himself in 2014. Mike Nestors score in the International match of 1496.119 – a new personal best – almost matched the National Record (Jeff Kehoes 1497.112). I think it’s fair to say that the Irish International Record – John Robinsons huge score of 1500.128 – set back in 2014 (his second time to hit the 1500) – is feeling a bit of pressure. Hilltops Denis Cummins & Paul Carr and Harbour Houses Toby O‘Brien all shot personal bests in the GRCF1500 – with Paul Carr taking the gold in his class. These are just some examples – I could go on all day. I counted 49 personal bests shot in the disciplines we shoot here at home – more besides in the disciplines unique to the Phoenix. The standard of shooting is in a very good place here in Ireland at the moment – and bodes well for both team and individual performances in the upcoming World Cup in MNSCI in July. It wasn’t quite the Isle of Man – but the craic was 90 nonetheless. The accomodations were, as always “eclectic”. The Germans, as always, put on a great night for everyone on the Saturday night – if you want to know more – you’ll just have to go next year!!. As always the banter and craic with the ROs was going on all weekend. But we loved every minute of it – and we won round us …… and we can’t wait to do it all again next year.